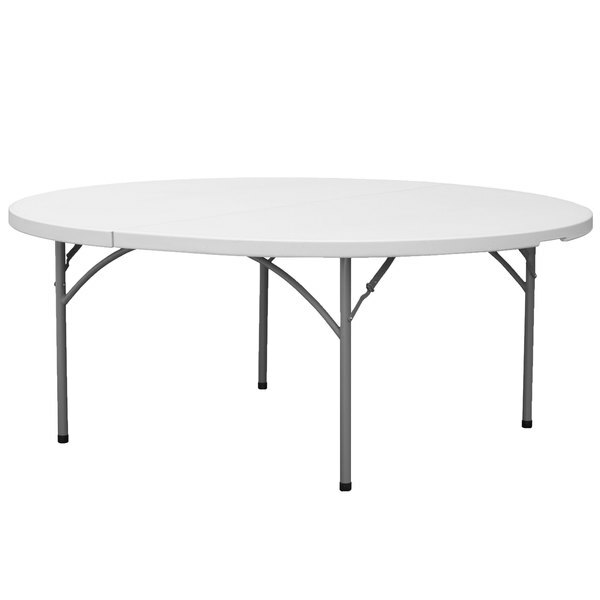 Perfect for both indoor and outdoor use, this 6' round folding table from Lancaster Table & Seating gives you the versatility you need at a price that can't be beat! Constructed of high impact polyethylene, this table will not crack, chip, or peel, and is stronger, lighter, and more durable than wood. Use it in dining rooms, kitchens, offices, conference rooms, restaurants, banquet halls, and, of course, at catered events! With a sturdy, powder-coated steel frame, 19 gauge steel legs, and 1 3/4" thick granite-colored top, this 72" round folding table is just what your business needs. With an evenly distributed weight capacity of 1100 lb., you can load up this table with appetizers for a party, or comfortably seat 8 - 10 people for a formal banquet. The folding legs make storage and transport a breeze, so that you can simply roll this table onto a table truck and move it on to your next event.